It’s slightly past 07:00hrs on a Wednesday morning, and the seats in the waiting area at the Cancer Diseases Hospital in Lusaka in the waiting area are all taken. The patients, some accompanied by their relatives, seem eager to fulfil their appointments with the doctors. “Midweeks are extremely busy here,” says Terence Nyirongo, the hospital’s Public Relations Officer. “Mondays and Fridays are much better”. It’s not quite surprising why the hospital seems overwhelmed. It is the first and only cancer treatment centre offering radiation therapy in Zambia. The hospital gets direct referrals from major hospitals around the country. Now 10 years old, the hospital attends to around 2,500 patients every year. It’s the biggest relief the country has seen in the fight against the menacing cancer diseases. Before the hospital was established, getting cancer treatment was a tall order. Patients had to pay through the nose travelling to other countries — especially South Africa and India — for treatment, and few people could afford, as it was very expensive. 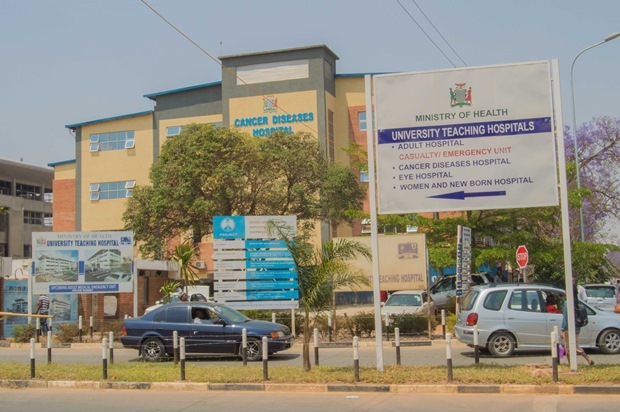 The Cancer Diseases Hospital is a classic case of how Zambia is succeeding in using nuclear technology to treat cancer, one of the most dreaded diseases in the country. “The last 10 years have been very exciting,” says Ms Mulape Kanduza, the hospital’s Chief Medical Physicist. Part of her job is to ensure that patients and medical staff at the hospital are protected from exposure to radioactive substances by administering measures that prevent them from being exposed to unsafe radioactive levels. She says that although there are some misgivings about the use of radioactive substances in the treatment among some patients, it’s the most effective and safest form of treatment, provided that the health professional is adequately trained on how to use radioactive substances. The hospital uses two types of cancer treatment: Radiotherapy and chemotherapy. Radiation therapy removes, kills, or damages cancer cells in a certain area while chemotherapy involves the use of one or more anti-cancer drugs as part of a standardized chemotherapy regimen and can work throughout the whole body. Over the last 10 years, more than 17,000 cases have been successfully diagnosed and treated at the hospital. “Now people in Zambia can access treatment locally for a fraction of the cost they would pay by travelling outside the country,” says Ms Kanduza. In spite of the successes over the last 10 years, the Cancer Diseases Hospital is not without challenges. “The biggest challenge is that, like any other equipment, age catches up. Our equipment has a life span and regularly required to be serviced. We’ve been replacing some of the equipment that has become obsolete. Plans are in place by the government through the Ministry of Health to replace equipment,” says Mrs Kandunza. The hospital also requires more staff to complement the more than 300 it has so far. The hospital has since started training its staff locally. It is now able to offer training locally for radiation therapists out of which two intakes have since graduated. The hospital plans to begin local training for other specialties such as radiation oncologists and medical physicists. Ms Kanduza adds that the anticipated Centre for Nuclear Science and Technology, which has been proposed by Russian firm nuclear firm Rosatom in collaboration with the Government of Zambia, will go a long way in advancing nuclear in medicine in Zambia by providing training and research as well as production of radiation sources that are required in the treatment of cancer.